Each summer I search for the elusive watermelon. You know the one I am talking about, the one that has perfectly firm flesh but melts in your mouth like sugar. It is the one watermelon that you judge all others by. 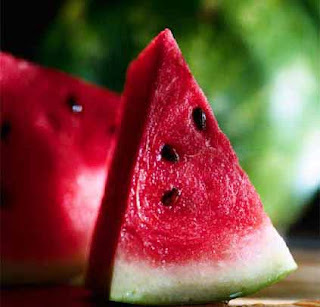 The flavor is intense, the seeds are few and all other watermelons before and after are measured by that one. What do you do when your first watermelon is absolutely amazing? Hope for more of the same or better? Or give stop and be satisfied that you didn't have to go through any disappointments? I am so conflicted! I have never found my elusive watermelon on the first try and so much of the season is still before me! Is it a trick? What would Tom Clancy do? "Y'know, I seen me a mermaid once. I even seen me a shark eat an octopus. But I ain't never seen no phantom perfect watermelon." Ping me, Vasili! One ping only.